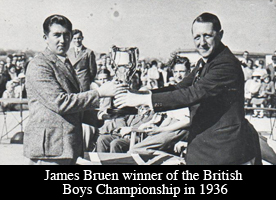 When I was in Northern Ireland recently, I saw a photograph of a golfer I knew nothing about: Jimmy Bruen, shown above, who was born in Belfast in 1920 and held the course record at Royal County Down for twenty-nine years. He won the British Boys’ Championship, at Royal Birkdale, when he was sixteen. This, remarkably, is what sixteen-year-olds looked like in the olden days. He drew the club back outside the line of flight and turned his wrists inward, to such an extent that at the top of the swing the clubhead would be pointing in the direction of the teebox. It was then whipped, no other word describes the action, inside and down into the hitting area with a terrible force. There was therefore in his swing a fantastic loop, defying all the canons of orthodoxy, which claims that the back and downswing should, as near as possible, follow the same arc. There must have been a foot or more between Bruen’s arcs of swing. 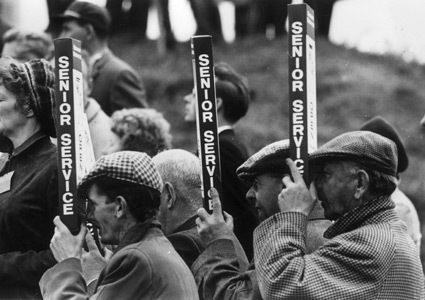 Henry Cotton, Open Championship, 1937. Bruen routinely drove the ball over three hundred yards, and he had a deadly short game. (He won the British Boys’ by chipping in for eagle on the twenty-seventh hole of the final, making him eleven up with nine holes to play.) 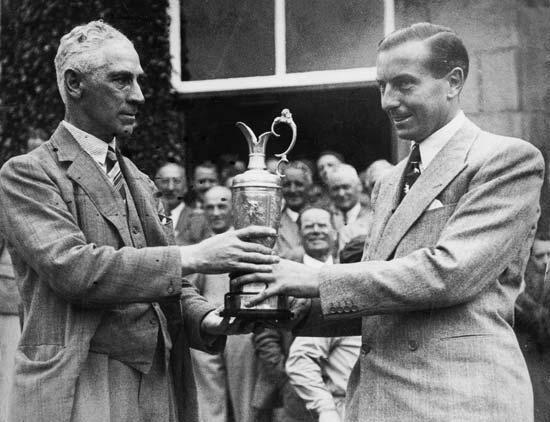 He lit up Irish golf before the war, and he won the first post-war British Amateur, in 1946. (He was the first Irishman ever to win it.) 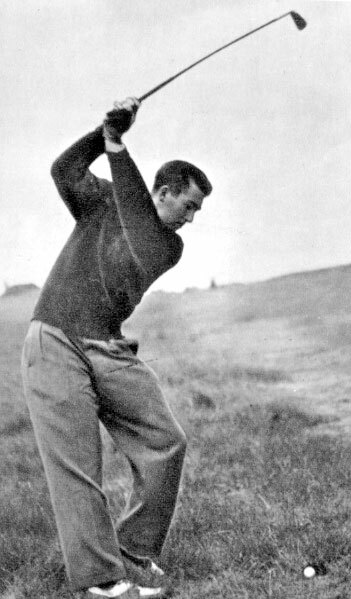 Cotton called him “the best golfer—professional or amateur—in the world.” He was widely favored to win the 1946 Open, but withdrew because, he said, his business left him insufficient time to practice. (He was an insurance broker.) He severely injured his wrist while working in his garden in 1947, and, following surgery that was only semi-successful, virtually stopped playing competitive golf. His last Walker Cup was 1951. He died in 1972, at the age of fifty-one. Ward-Thomas wrote: “Bruen was the most fascinating golfer I have ever seen or probably will ever see. There was no limit to what he might have achieved had not the War come and had he so desired.” George F. Crosbie published a biography in 1999. 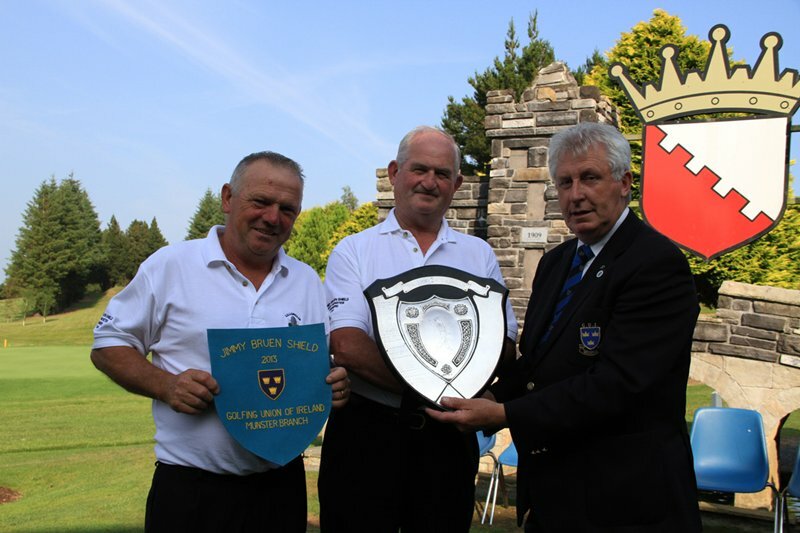 The Golfing Union of Ireland established the Jimmy Bruen Shield in his memory in 1978. In 2006, my wife and our two children and I flew from New York to Las Vegas so that we could rent an R.V. and spend ten days visiting the remarkable national parks in southern Utah and northern Arizona, after first taking a guided tour of the greatest man-made object in the universe, the Hoover Dam. 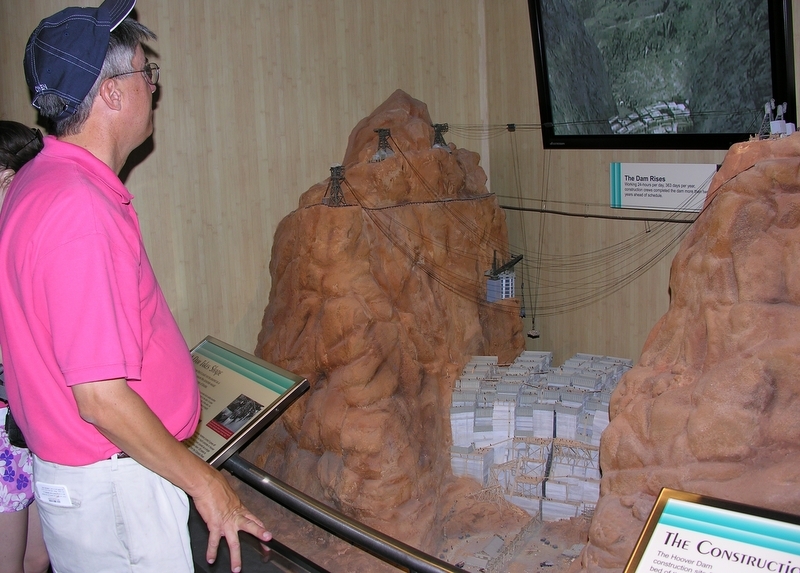 Me, standing in awe before one of the many fascinating dioramas in the visitors’ center at the Hoover Dam, June, 2006. Our flight coincided almost exactly with the final round of the 2006 U.S. Open, and because I am a good father I grumbled very little about having to spend the afternoon traveling with my loved ones rather than lying on the couch at home and staring at the TV. My saintly attitude was rewarded during the flight: there were video screens in the backs of the seats on our plane, and I got to watch the tournament anyway. In fact, the broadcast lasted almost exactly as long as the flight. The picture broke up as we were touching down at McCarran International Airport, in Vegas, but by then the tournament was all but over. Phil Mickelson had just pushed his tee shot on the final hole into the corporate tents to the left of the eighteenth fairway, but he had the thing sewn up, and, besides, the guy’s a magician. Good show, Phil! The next morning, in my wife’s and my room at the Bellagio (or wherever), I turned on the TV to watch Open highlights. Weirdly, the guys on Golf Central weren’t talking about Mickelson; they were talking about Geoff Ogilvy, whom I scarcely remembered having noticed during my life, much less during the broadcast the day before. Suddenly, I worried that what I had watched on the plane had been not a live program but a videotape of some historical triumph of Mickelson’s. It took me five minutes of careful Golf Channel viewing to figure out what had happened. Naturally, I blamed myself for Mickelson’s last-hole double-bogey, since I was mentally rooting for him toward the end of the tournament, and the in-flight broadcast cut out at the moment when he needed me most. And this week I blame myself for his victory, at Muirfield, because I wanted Tiger Woods to win but was unable to mentally undermine his opponents: instead of watching the golf tournament on TV, I was (selfishly) playing in a golf tournament of my own. 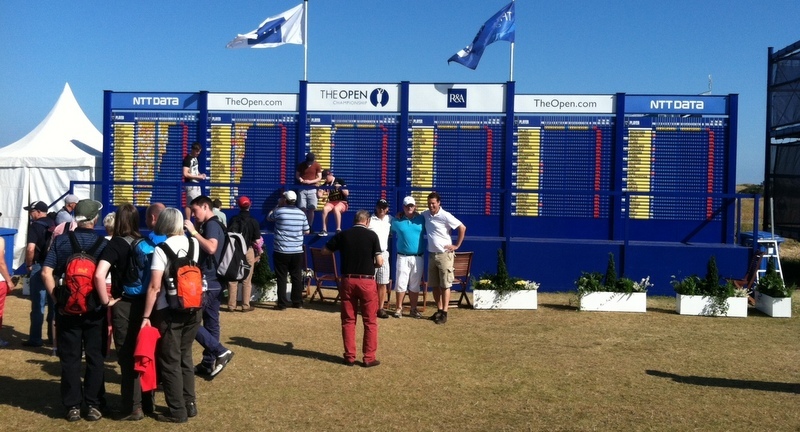 Rick Hunt, at the Open. If I’d been there myself, I might have had better luck at influencing the outcome. Influencing the outcome of televised sporting events is harder than many people believe, because a technique that brings victory today may have the opposite effect tomorrow. Mumbling obscenities, swaying hypnotically, and making hula-like hand motions in front of the screen will usually keep a long putt from going in—especially if the hole remains on camera and the putter is Lee Westwood—but the same method sometimes fails disastrously, perhaps by accidentally nudging an errant ball onto the correct line. Curiously, the best method for salvaging victory when things are going poorly is to turn off the TV—a tactic whose effectiveness is explained by quantum mechanics: unless they are observed directly, athletic competitions, like muons and mesons, exist in all possible states simultaneously. Turning off the TV during a big tournament restores the universe’s indifference to the final score, thereby giving Tiger (let’s say) a chance to rediscover his swing. This quantum effect may also explain why viewers are able to influence even videotaped sporting events—as long as the viewers don’t know in advance how everything came out. For that reason, I had planned to remain ignorant of the Open outcome so that I could watch a recording of the final round when I got home and bring in the winner I wanted. Sadly, though, as I was standing in line at the scorer’s table I overheard some guy telling some other guy that Mickelson had won. I watched the recording anyway, but without much enthusiasm. I had to hit the mute button many times, because the announcers were so annoying, and I found myself wishing that someone would invent an app (or whatever) that would turn Curtis Strange’s accent into something less grating (converting nahn, fahn, and mahn into nine, fine, and mine, for example); would automatically bleep out the phrase “plenty of green to work with”; and would prevent Andy North from referring to Royal Birkdale, where the Senior Open Championship will be played next week, as a “links-style” golf course. Hacker (real name), Royal Birkdale, May, 2010. 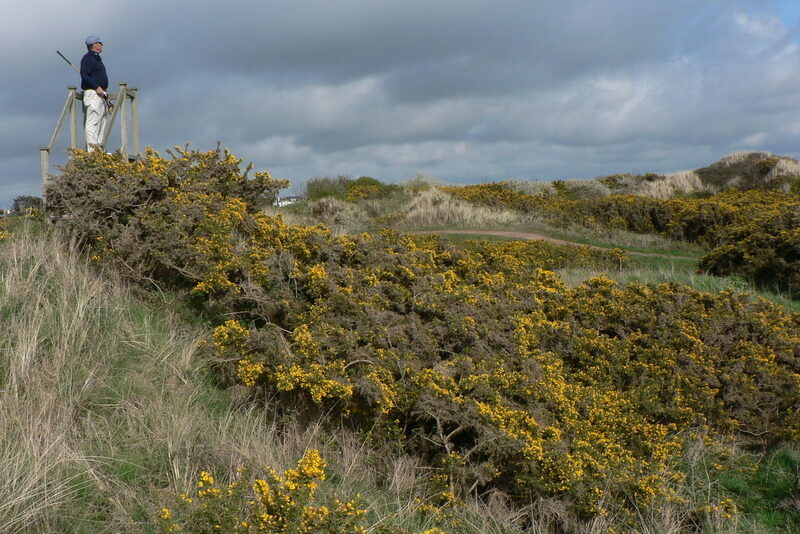 Royal Birkdale, May 19, 2013. 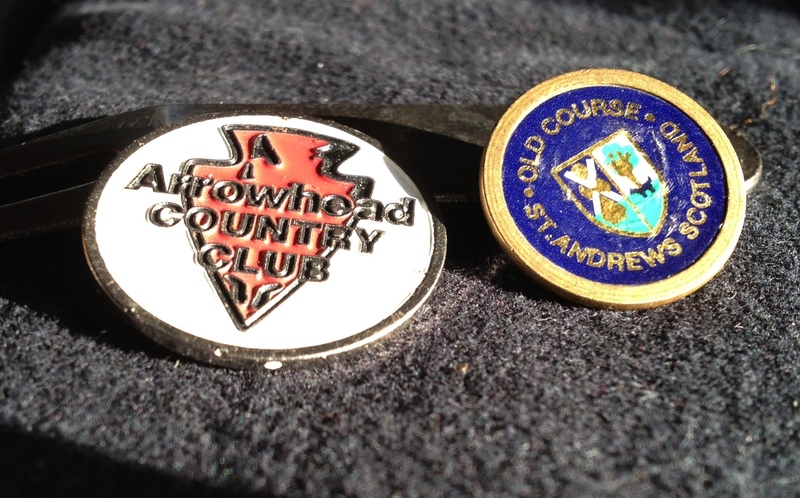 Before we teed off, I bought my wife a sweater in the golf shop and decided not to buy myself an enameled ball marker. Then, during our round, I found an enameled ball marker that was even nicer than the one I had decided not to buy. 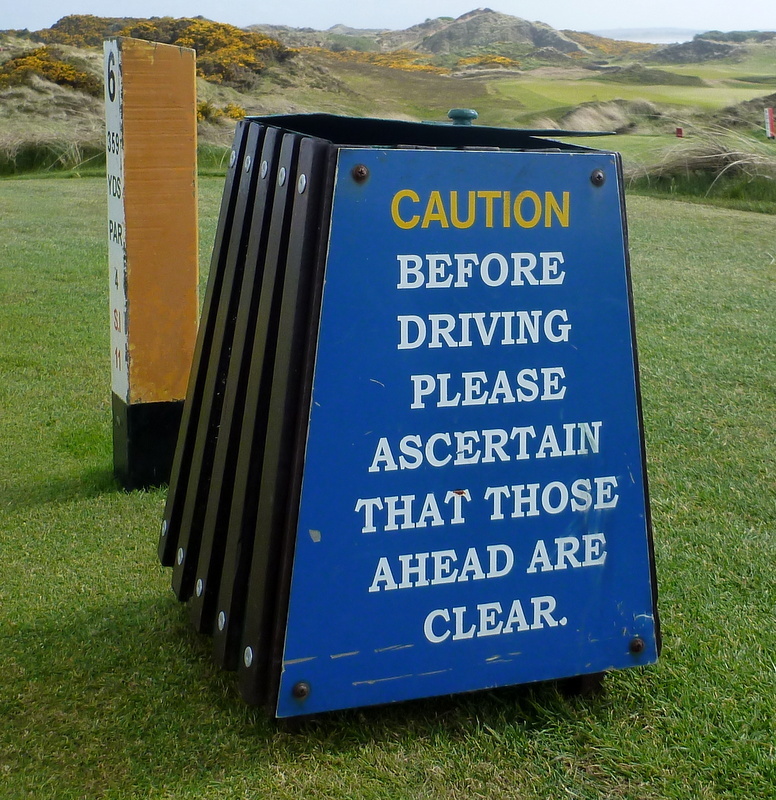 The exact same thing (except for the part about my wife) happened to me a year ago, at Cruden Bay, in Scotland. The ball marker I found there turned out to be one of the luckiest I’ve ever owned, for about a month. Fingers crossed! I found the ball markers below (along with one from a course in Ireland I have since lost) on a fairway at Pacific Dunes in 2008. They did not seem to have been dropped accidentally from someone’s pocket. They were arranged in a small triangle with a well-worn repair tool in the middle. The last act of a frustrated golfer after watching one more drive arc toward the rocks and surf? Or maybe a little memorial to a departed golfing buddy? The view from that point in the fairway was wonderful. As I do with all the markers I keep in my golf bag, I rotate the Arrowhead marker in and out of my game. The first three-putt sends it into time-out. 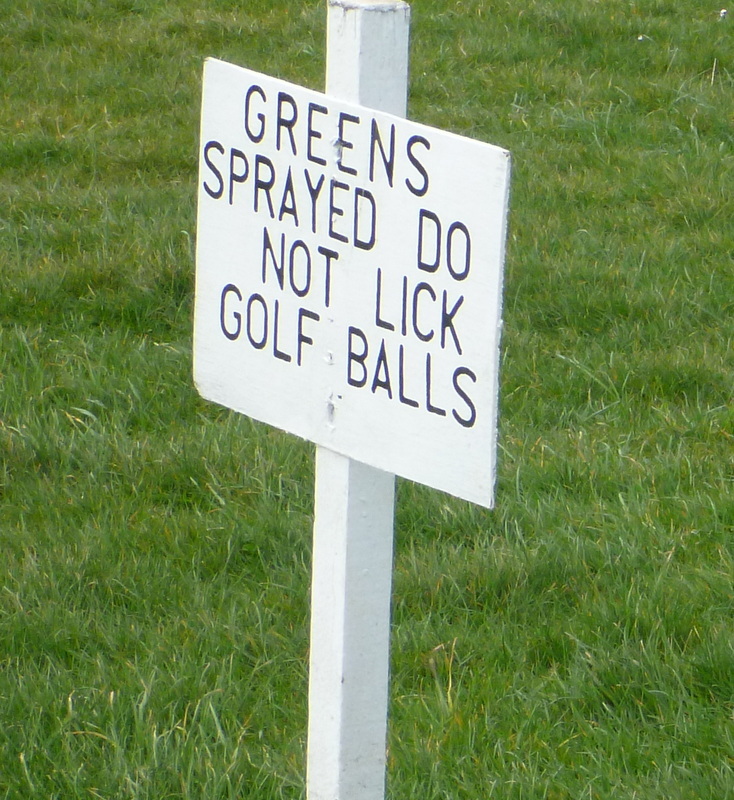 But I never use the Old Course marker. I don’t want to lose it. Maybe I will find the owner or his/her son/daughter someday. I caddied for my dad back in the early sixties, but a huge banana slice and indifferent putting convinced me that tennis was more my game. When I turned fifty, my brother-in-law the pilot-golfer (what else do they have to do when they are not driving a 737?) persuaded me to play a round. I shot 99. I was hooked. My wife (hey, it was her brother who got me into this) made fun of my golf habit. “Why would any human being need more than ONE pair of golf shoes?” Luckily for me, she took up golf, became a 9-handicap, and soon bought her third pair of golf shoes. The trip to Bandon was our first big golf vacation together. 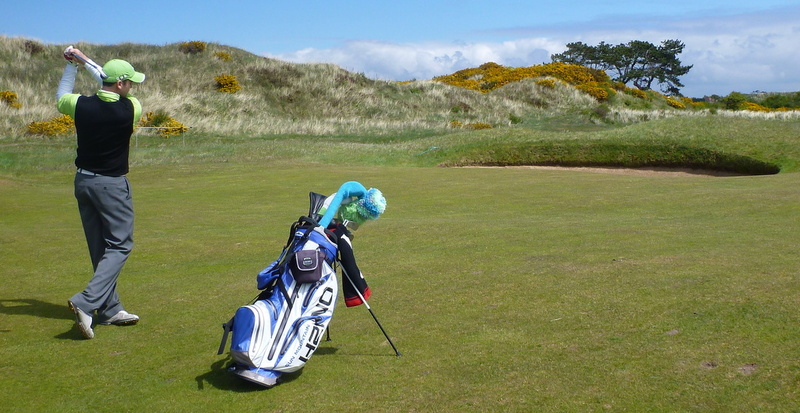 The first round, at Pacific Dunes, was memorable not only for the stunning setting but also for finding the ball markers. It was so windy that my stand-bag blew over—twice. I’m now sixty-two years old, and my index is 4.5, and I keep about ten ball markers and three repair tools in the rotation. The repair tools don’t seem to have the same cosmic effect on my putting as the markers. I’m also up to four pair of golf shoes. I’ll put up more What’s In My Bag items as soon as I’m back in the States. I’ve got several in the hopper, but there’s room for more. Keep ’em coming—and include at least one photo and a golf-oriented description of yourself. 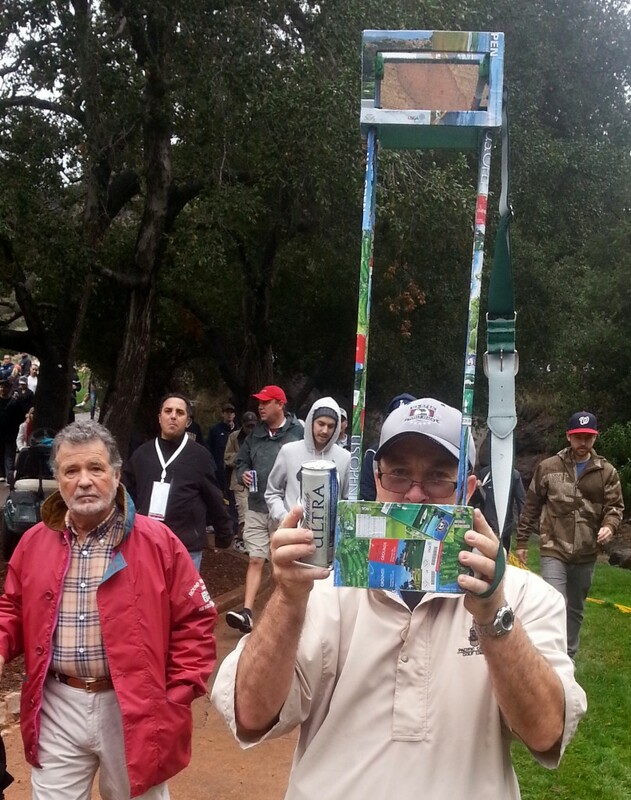 Steve Davis and his invention at Sherwood Country Club, Thousand Oaks, California, December 2, 2012. Davis works for a copier company. He has “wallpapered” his invention with color copies of mementos from other golf tournaments he’s attended, including the 2010 U.S. Open. If you’d like to give him a lot of money to manufacture these things full time, let me know, and if you don’t sound like a nut I’ll put you in touch. 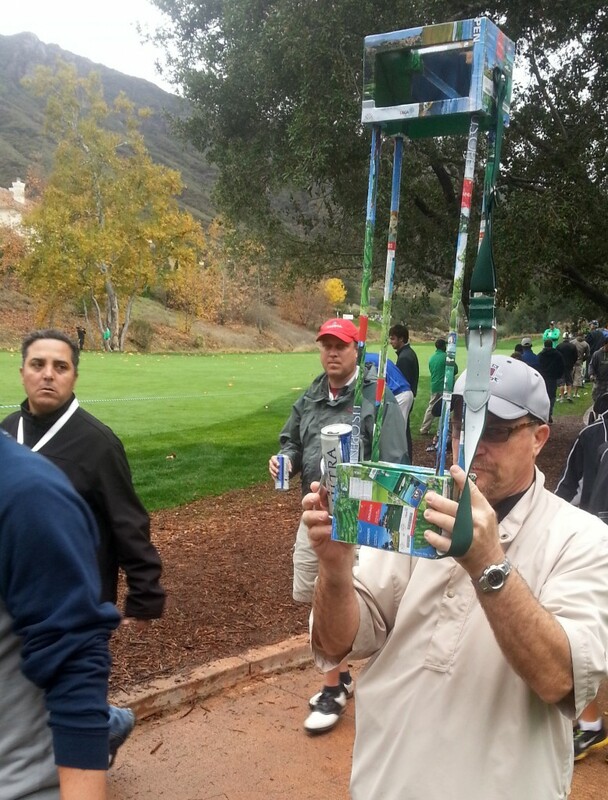 Many spectators at the 1993 Ryder Cup, which I attended (at the Belfry, in England), had periscopes that looked like the boxes that bottles of Johnny Walker scotch come in. 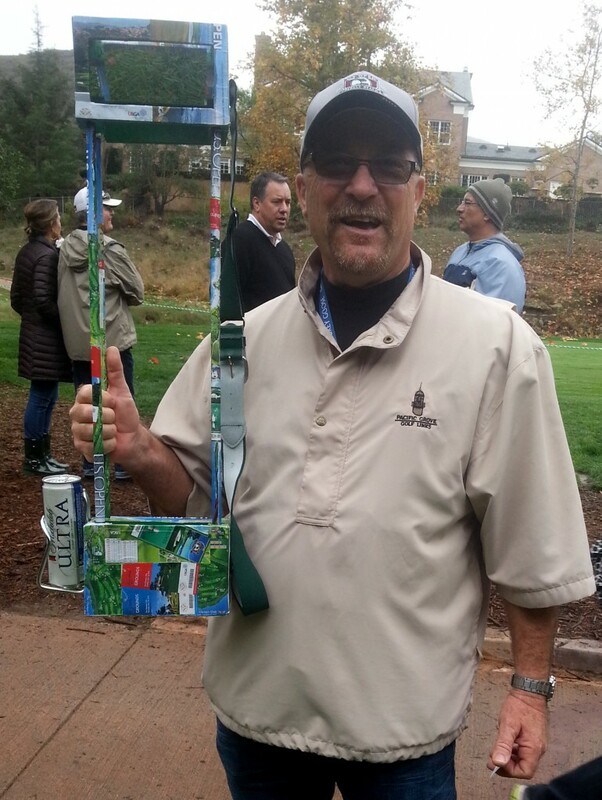 (Johnny Walker sponsored the tournament.) 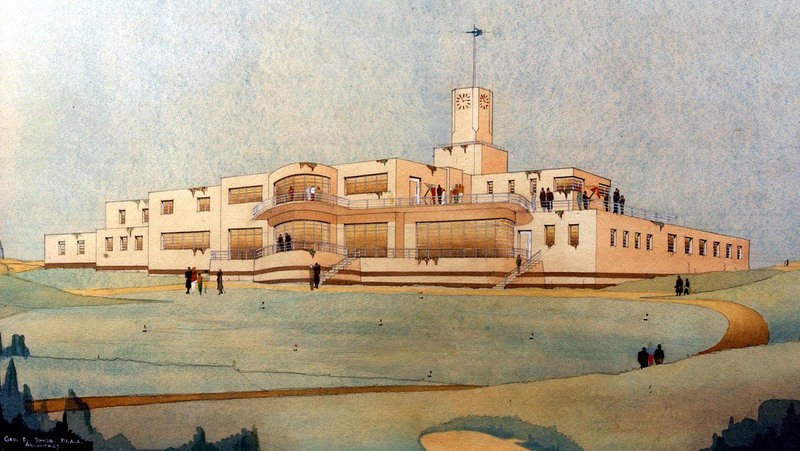 The Belfry is a terrible course for spectators, and the periscopes made things better for the people who had them and worse for the people who didn’t. The only way to improve Davis’s invention, I think, would be to add a second beer holder. 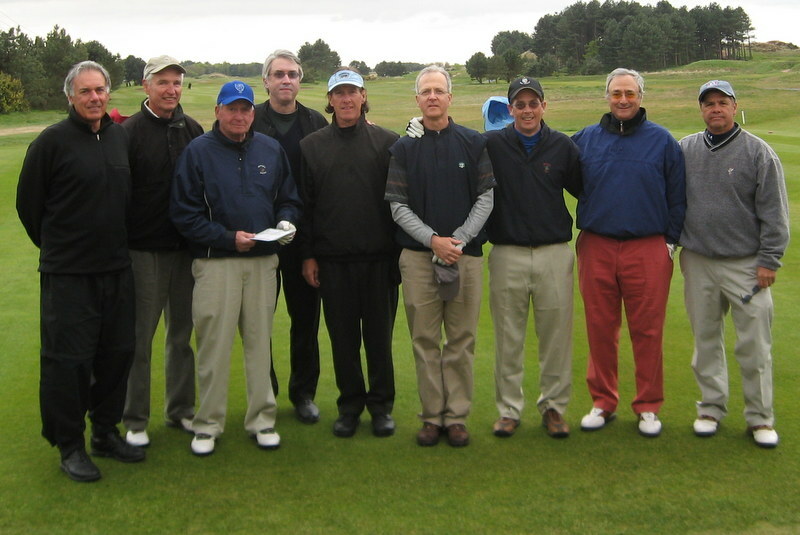 Tony, Rick, Hacker (real name), David O., Brendan, David W., Tim, Other Gene, Ray, Hillside Golf Club, England, May, 2010. My friends and I have taken some terrific golf trips over the past dozen years, including one to Scotland and two to Ireland. 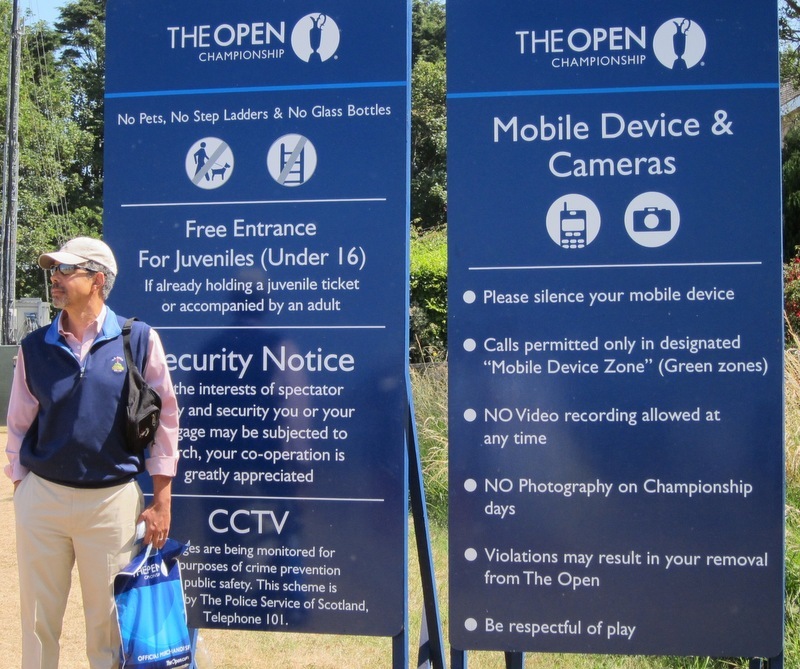 Our best trip ever, though, may have been the one we took in the spring of 2010 to the part of England where the Open Championship will be played this week. 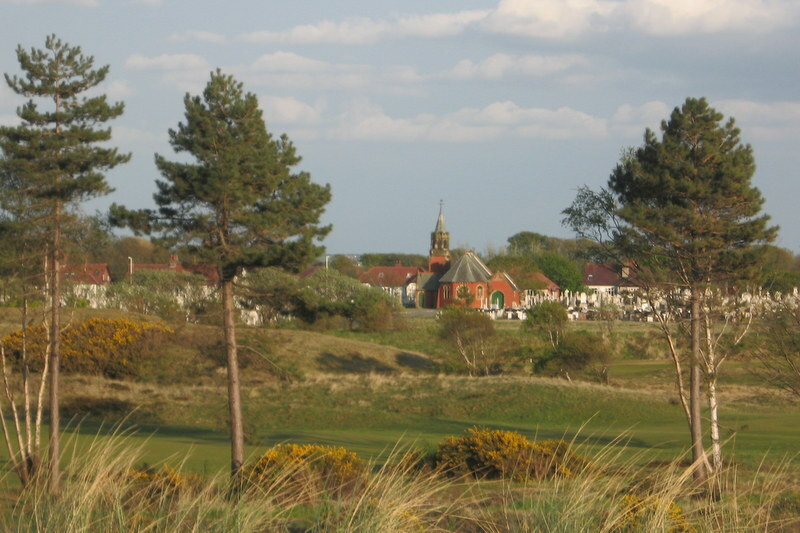 England’s Lancashire coast—which is also known as the Golf Coast—contains one of the world’s densest concentrations of superb links courses, including three on the Open Rota (Royal Liverpool, Royal Birkdale, and this week’s venue, Royal Lytham & St. Annes.) My friends and I played fourteen rounds on eleven courses in eight days, and over dinner on the final night we went around the table and each named the one course we’d most like to play again. There were nine of us, and we picked eight different courses. The do-over course I named at dinner on the final night: Southport & Ainsdale, which I hadn’t even expected to like. That’s Birkdale Cemetery in the distance. One reason the trip worked so well is that we did very little driving. The distance by air between Royal Liverpool (at the southern end) and Royal Lytham (at the northern end) is less than thirty miles, and we rented three three-bedroom apartments in Southport, a resort town roughly halfway between them. The rent worked out to something like $30 per man per day. We had views of the Irish Sea, and we could walk into town. 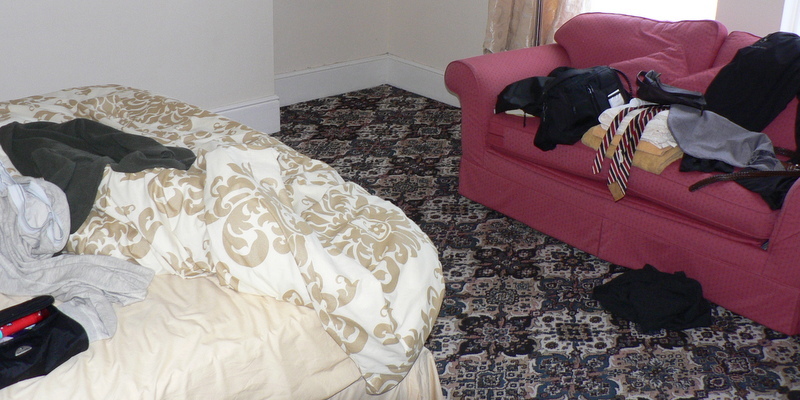 Extremely light housekeeping: my bedroom in our apartment in Southport. Note the necktie, which was required for dinner in the clubhouse at Royal Lytham & St. Annes. 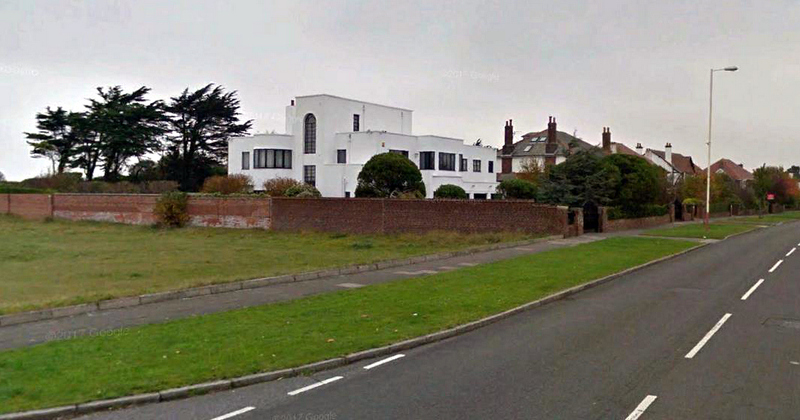 We spent just one night away from our apartments, in nine single rooms in the Dormy House at Royal Lytham. That club offers several package deals, and they’re a bargain. We got two rounds of golf on the championship course, three meals in the clubhouse, and a night in the Dormy House for less than the à-la-carte price of two rounds of golf. 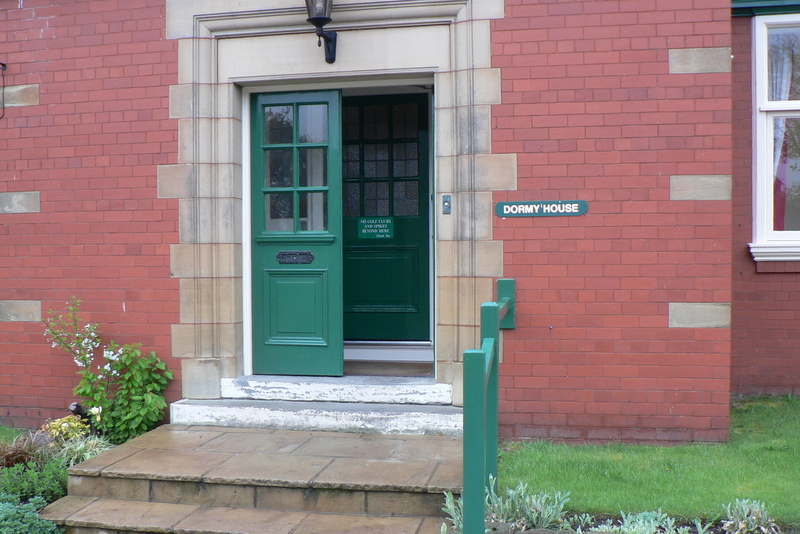 The Dormy House at Royal Lytham & St. Annes. 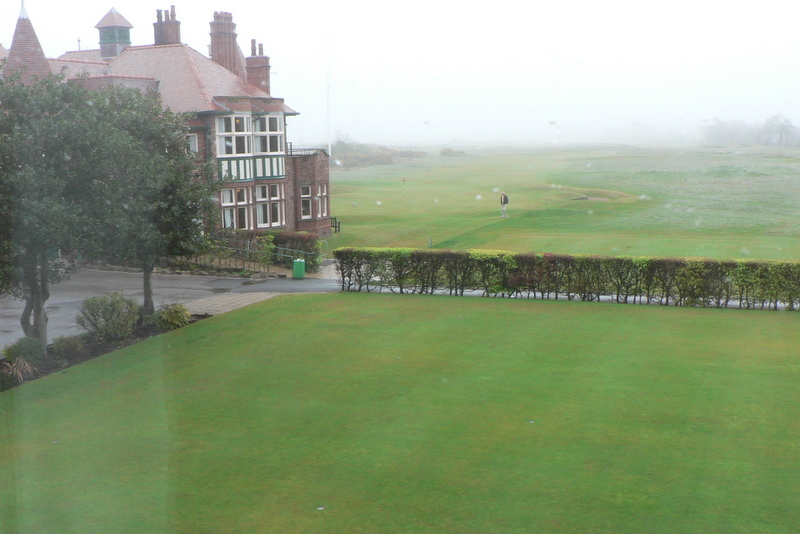 My bedroom window looked out on the practice putting green, the eighteenth green, and the clubhouse (the building on the left). The view from my room in the Dormy House. Lytham is the only Open course that begins with a par 3, a 200-plus-yarder with a circular green surrounded by ravenous bunkers. My favorite hole on the course is another par 3, the ninth, which looks like a golf hole in a dream: the green is elevated and undulating, like a graduate-level problem in topology. It’s tucked into the farthest corner of the course, and a cluster of red-brick buildings rises directly behind it, and if you flub your tee shot, an assistant pro told me, you can easily make 10. Ninth green: don’t be long; don’t be short; don’t go right; don’t go left. 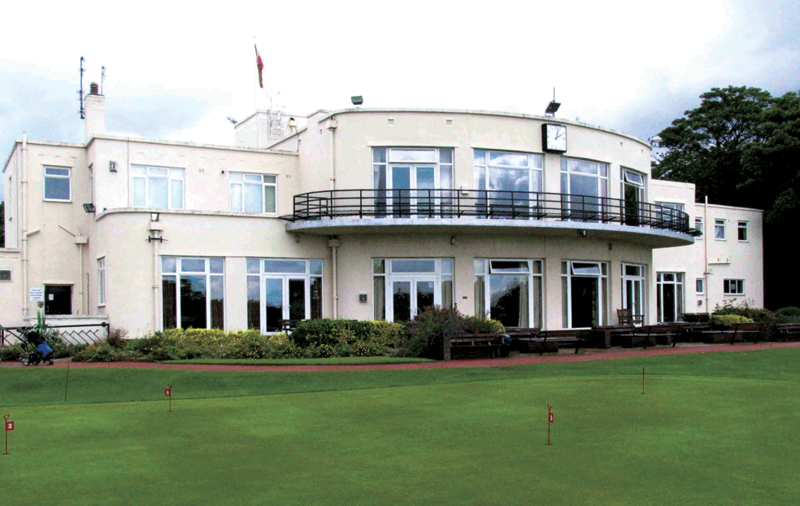 Within the city limits of Southport are three excellent courses—Royal Birkdale, Hillside, and Southport & Ainsdale—and one quite good one: Hesketh, which is the home of the Hitler Tree. 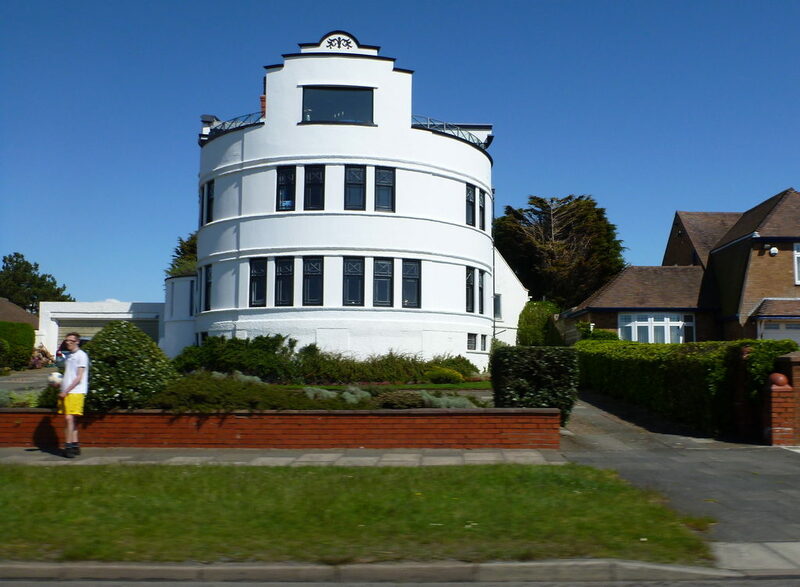 The first three are laid out almost continuously along the coast to the south of town; they are so close together that if you miss the driveway for Birkdale, heading south, the handiest place to turn around is the side street that leads to Hillside. 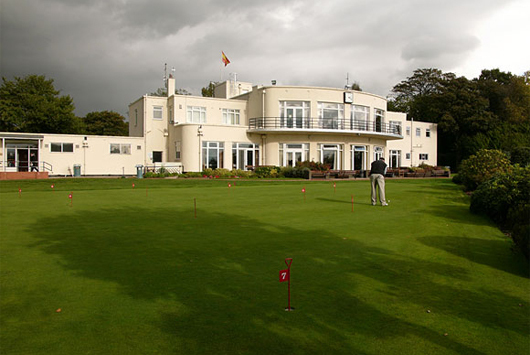 And at Hillside it’s entirely possible to hook a ball onto Southport & Ainsdale. I’ll have more to say about all those courses, and the others we played, later this week. 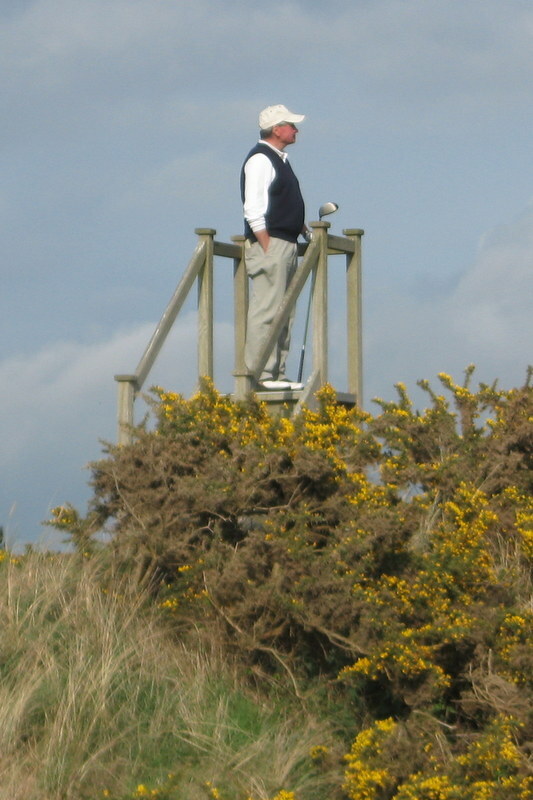 David O., Gene P., Royal Lytham.